- 殘編 (Tanya Hsu) on 七月 27, 2016. Ten years ago, London, Ontario based Black Fly Beverage Company received the first distillery license awarded in Ontario in 100 years, making itself a Canadian success story in the world of alcohol beverages. Having already captured six percent of the LCBO’s two hundred and forty million dollar ready-to-drink (RTD) market, Black Fly continues to expand and innovate by distributing its line of over 13 RTD products, which includes the company’s “not too sweet” Canadian craft-produced mixed spirit drinks, to nine Canadian provinces, three territories and four states in the US. 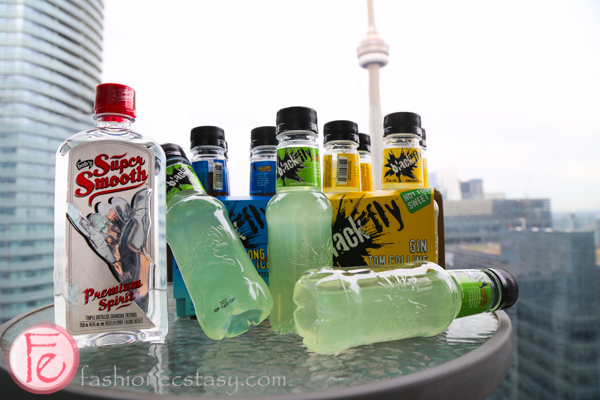 For this summer, in addition to introducing two new exciting flavours: the Black Fly Gin Tom Collins and Black Fly Vodka Sour Raspberry to its line-up of “not too sweet” beverages, Black Fly is also offering its very first spirit, bob’s SUPER SMOOTH™ Vodka. Unlike other vodkas, which are made from potatoes, corns, or grains, bob’s SUPER SMOOTH vodka is made from whey, making it gluten-free, grain-free, and lactose-free. The product is triple distilled, charcoal filtered and delivers what its name promises: a smooth and remarkably drinkable vodka, which can be enjoyed neat, on the rocks or with your favourite mix. For my summer parties, I simply add an additional kick of bob’s SUPER SMOOTH vodka to Black Fly’s line of “not too sweet” vodka sours. Because even though the “not too sweet” bottles already contain 7% alc./vol., but hey, they also come in Black Fly’s non-breakable and re-sealable eco packaging. Plus, guests are always thirsty for more. Place any Black Fly RTD bottle in freezer. Take out the bottle after frozen, let stand for 5-10 minutes and squeeze into a cocktail glass. Blend ice with Black Fly Tequila Margarita. Serve in a salt-rimmed glass. Mix 2 parts Black Fly with 1 part champagne or sparkling wine. Serve in a champagne glass (add some frozen berries into glass for a fresh twist). bob’s SUPER SMOOTH Vodka contains 40.5% alc./vol. and is priced at $26.95 CAD per 750 mL bottle. The product is available at LCBO across Ontario. The new Black Fly Gin Tom Collins is made locally with real lemon and lime juices and is lightly sweetened with cane sugar. It is gluten free and delivers a refreshingly dry profile. Black Fly Gin Tom Collins is available in 400mL large, non-breakable and re-sealable bottles sold at $10.55 per 4-pack (plus deposit). The product contains 7% alc./vol. The new Black Fly Vodka Sour Raspberry is made with real raspberry juice mixed with smooth Canadian Vodka, and lightly sweetened with cane sugar. The mixed drink is 7% alc./vol. and is available for $2.85 CAD (plus deposit) per 473 mL can. To get a taste of all Black Fly products, try the Black Fly Party Pack, which contains 3 rum mojitos, 3 tequila margaritas, 3 long island teas, and 3 whisky sours. It’s a Black Fly bar in a box!